Plum, any of various trees or shrubs in the genus Prunus (family Rosaceae) and their edible fruits. Plums are closely related to peaches and cherries and are widely eaten fresh as a dessert fruit, cooked as compote or jam, or baked in a variety of pastries. The European plum (P. domestica) and the Japanese plum (P. salicina) are grown commercially for their fruits, and a number of species, including the purple-leaf plum (P. cerasifera), are used as ornamental plants for their attractive flowers and leaves. Trees of some plum species reach a height from 6 to 10 metres (20 to 33 feet), while others are much smaller; some species are small shrubs with drooping branches. The flower buds on most varieties are borne on short spurs or along the terminal shoots of the main branches. Each bud may contain from one to five flowers, two or three being most common, and often give an appearance of densely packed, showy flower clusters when the trees are in full bloom. Each flower features a hollow cuplike structure known as the hypanthium, which bears the sepals, petals, and stamens on the outer rim and surrounds a single pistil. After fertilization the hypanthium and its attachments fall off, leaving the ovary to develop into a drupe fruit. As the fruit grows, the outer part ripens into a fleshy juicy exterior, and the inner part forms the stone, or pit, which encloses the seed. The fruits show a wide range of size, flavour, colour, and texture. As trees come into bearing, they do not require much pruning and can be grown satisfactorily in a home fruit garden if diseases and pests are controlled. Plums are widely cultivated throughout the world, and many varieties are adapted to a range of soils and climatic conditions. The common European plum (P. domestica) probably originated in the region around the Caucasus and the Caspian Sea and is at least 2,000 years old. Another Old World plum species, probably of European or Asiatic origin, is the Damson plum (P. insititia); ancient writings connect early cultivation of those plums with the region around Damascus. The Japanese plum was first domesticated in China thousands of years ago but was extensively developed in Japan; from there it was introduced to the rest of the world. Japanese plums have a longer shelf-life than most European varieties and are thus the most common fresh plum sold commercially. Plum varieties that can be dried without resulting in fermentation are called prunes. Such plums have firm flesh and contain high levels of sugar, qualities that favour their being preserved by drying, which is done in dehydrators or in the sun. Date palm, (Phoenix dactylifera), tree of the palm family (Arecaceae, or Palmae), found in the Canary Islands, northern Africa, the Middle East, Pakistan, India, and the U.S. state of California. The date palm grows about 23 metres (75 feet) tall. Its stem, strongly marked with the pruned stubs of old leaf bases, terminates in a crown of graceful, shining, pinnate leaves about 5 metres (16 feet) long. Floral spikes branch from the axils of leaves that emerged the previous year. Male and female flowers are borne on separate plants. Under cultivation the female flowers are artificially pollinated. The date is a one-seeded fruit, or berry, usually oblong but varying much in shape, size, colour, quality, and consistency of flesh, according to the conditions of culture. More than 1,000 dates may appear on a single bunch weighing 8 kg (18 pounds) or more. The dried fruit is more than 50 percent sugar by weight and contains about 2 percent each of protein, fat, and mineral matter. 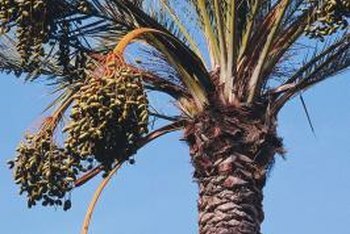 The date palm has been cultivated and prized from remotest antiquity; its fruit has been the staple food and chief source of wealth in the irrigable deserts of North Africa and the Middle East. Spanish missionaries carried the tree to the New World in the 18th and early 19th centuries. All parts of the date palm yield products of economic value. Its trunk furnishes timber; the midribs of the leaves supply material for crates and furniture; the leaflets, for basketry; the leaf bases, for fuel; the fruit stalks, for rope and fuel; the fibre, for cordage and packing material; and the seeds are sometimes ground and used as stock feed. Syrup, alcohol, vinegar, and a strong liquor are derived from the fruit. The sap is also used as a beverage, either fresh or fermented, but, because the method of extraction seriously injures the palm, only those trees that produce little fruit are used for sap. When a palm is cut down, the tender terminal bud is eaten as a salad. The tree is propagated either from seeds or from suckers, offshoots that arise chiefly near the base of the stem in the early years of the life of the palm. Offshoots are used for commercial plantings. When offshoots are three to six years old and have formed roots of their own, they are removed and planted. Palms begin to bear fruit in 4 to 5 years and reach full bearing at 10 to 15 years, yielding 40 to 80 kg (90 to 180 pounds) or more each. Palms are known to live as long as 150 years, but their fruit production declines, and in commercial culture they are replaced at an earlier age. Saudi Arabia, Egypt, Iran, and Iraq are the leading date-producing and exporting countries, although fruit from Algeria and Tunisia also is well known in Europe. California is the major American producer. The date palm is grown as an ornamental tree along the Mediterranean shores of Europe, and its leaves are used for the celebration of Palm Sunday among Christians and for the celebration of the Feast of Tabernacles among Jews. Date sugar, a commercial product of India, is obtained from the sap of a closely related species, Phoenix sylvestris. • Spinach is storehouse for many phytonutrients that have health promotion and disease prevention properties. • It is very low in calories and fats (100 g of raw leaves provide just 23 calories). Also, its leaves hold a good amount of soluble dietary fiber; no wonder why this leafy greens often recommended by dieticians in the cholesterol controlling and weight reduction programs! • Fresh 100 g of spinach contains about 25% of daily intake of iron, one of the highest for any green leafy vegetables. Iron is an essential trace element required by the human body for red blood cell production and as a co-factor for an oxidation-reduction enzyme, cytochrome oxidase during the cellular metabolism. • Fresh leaves are a rich source of several vital antioxidant vitamins like vitamin-A, vitamin-C, and flavonoid polyphenolic antioxidants such as lutein, zeaxanthin, and β-carotene. Together, these compounds help act as protective scavengers against oxygen-derived free radicals and reactive oxygen species (ROS) that play a healing role in aging and various disease processes. • Zeaxanthin, an important dietary carotenoid, is selectively absorbed into the retinal macula lutea in the eyes where it thought to provide antioxidant and protective UV light-filtering functions. It thus helps protect from "age-related macular related macular disease" (ARMD), especially in the older adults. • Further, vitamin-A is required for maintaining healthy mucosa and skin and is essential for night vision. Consumption of natural vegetables and fruits rich in vitamin-A and flavonoids are also known to help the body protect from lung and oral cavity cancers. • Spinach leaves are an excellent source of vitamin-K. 100 g of fresh greens provides 402% of daily vitamin-K requirements. Vitamin-K plays a vital role in strengthening the bone mass by promoting osteoblastic activity in the bones. Additionally, it also has an established role in patients with Alzheimer's disease by limiting neuronal damage in the brain. • This green leafy vegetable also contains good amounts of many B-complex vitamins such as vitamin-B6 (pyridoxine), thiamin (vitamin B-1), riboflavin, folates, and niacin. Folates help prevent neural tube defects in the newborns. • 100 g of farm fresh spinach has 47% of daily recommended levels of vitamin-C. Vitamin-C is a powerful antioxidant, which helps the body develop resistance against infectious agents and scavenge harmful oxygen-free radicals. • Its leaves also contain a good amount of minerals like potassium, manganese, magnesium, copper and zinc. Potassium is an important component of cell and body fluids that helps controlling heart rate and blood pressure. The human body uses manganese and copper as a co-factor for the antioxidant enzyme, superoxide dismutase. Copper is also required for the production of red blood cells. Zinc is a co-factor for many enzymes that regulate growth and development, digestion and nucleic acid synthesis. • It is also a small source of omega-3 fatty acids. • Fresh, tender spinach leaves (baby spinach) can be eaten raw either in salad and vegetable burgers or as juice. Antioxidant properties may decrease significantly on steaming, frying and boiling for longer periods. • Along with other vegetables, its leaves are used in the preparation of noodles, pie, pasta, pilaf (pulao), and soups as well as in the preparation of baby foods. • In India and Pakistan, where it is popular as "palak," spinach features in a variety of delicious cooking such as "palak paneer" (with cottage cheese), aloo-palak (with potato), fried rice, chicken and meat preparations. • In India and Bangladesh spinach is mixed with other seasonal greens like goosefoot (Chenopodium album), fenugreek, mustard greens, Malabar spinach (Basella alba), etc., to prepare "saag" which is eaten with unleavened bread (roti), and rice. • Reheating of spinach leftover may cause conversion of nitrates into nitrites and nitrosamines by certain bacteria that thrive on pre-prepared nitrate-rich foods such as spinach and many other green vegetables. These harmful compounds may be bad for health, especially in children. • Phytates and dietary fiber present in the leaves may interfere with the bioavailability of iron, calcium, and magnesium. • Because of its high vitamin-K content, patients taking anti-coagulants such as "warfarin" are encouraged to avoid spinach in their food since it interferes with drug metabolism. • Spinach contains oxalic acid, a naturally-occurring substance found in some vegetables, which may crystallize as oxalate stones in the urinary tract in some people. Individuals with known oxalate urinary tract stones are advised to avoid eating certain vegetables belonging to Amaranthaceae and Brassica family. Adequate intake of water is therefore advised to maintain normal urine output. Clove, small, reddish-brown flower bud of the tropical evergreen tree Syzygium aromaticum (sometimes Eugenia caryophyllata) of the family Myrtaceae, important in the earliest spice trade and believed indigenous to the Moluccas, or Spice Islands, of Indonesia. Strong of aroma and hot and pungent in taste, cloves are used to flavour many foods, particularly meats and bakery products; in Europe and the United States the spice is a characteristic flavouring in Christmas holiday fare, such as wassail and mincemeat. As early as 200 BC, envoys from Java to the Han-dynasty court of China brought cloves that were customarily held in the mouth to perfume the breath during audiences with the emperor. During the late Middle Ages, cloves were used in Europe to preserve, flavour, and garnish food. Clove cultivation was almost entirely confined to Indonesia, and in the early 17th century the Dutch eradicated cloves on all islands except Amboina and Ternate in order to create scarcity and sustain high prices. In the latter half of the 18th century the French smuggled cloves from the East Indies to Indian Ocean islands and the New World, breaking the Dutch monopoly. The clove tree is an evergeen that grows to about 25 to 40 feet (8 to 12 m) in height. Its gland-dotted leaves are small, simple, and opposite. The trees are usually propagated from seeds that are planted in shaded areas. Flowering begins about the fifth year; a tree may annually yield up to 75 pounds (34 kg) of dried buds. The buds are hand-picked in late summer and again in winter and are then sun-dried. The island of Zanzibar, which is part of Tanzania, is the world’s largest producer of cloves. Madagascar and Indonesia are smaller producers. Cloves vary in length from about 1/2 to 3/4 inch (13 to 19 mm). They contain 14 to 20 percent essential oil, the principal component of which is the aromatic oil eugenol. 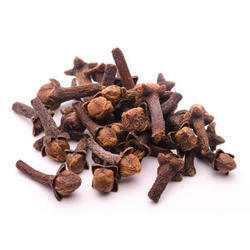 Cloves are strongly pungent owing to eugenol, which is extracted by distillation to yield oil of cloves. This oil is used to prepare microscopic slides for viewing and is also a local anesthetic for toothaches. Eugenol is used in germicides, perfumes, and mouthwashes, in the synthesis of vanillin, and as a sweetener or intensifier. Clove, small, reddish-brown flower bud of the tropical evergreen tree Syzygium aromaticum (sometimes Eugenia caryophyllata) of the family Myrtaceae, important in the earliest spice trade and believed indigenous to the Moluccas, or Spice Islands, of Indonesia. Is this what known in Indonesia as "cengkeh"? Yes. 'cengkeh' (Indonesian) is 'clove' in English. Onion, (Allium cepa), herbaceous biennial plant in the amaryllis family (Amaryllidaceae), grown for its edible bulb. The onion is likely native to southwestern Asia but is now grown throughout the world, chiefly in the temperate zones. Onions are low in nutrients but are valued for their flavour and are used widely in cooking. They add flavour to such dishes as stews, roasts, soups, and salads and are also served as a cooked vegetable. The common onion has one or more leafless flower stalks that reach a height of 75–180 cm (2.5–6 feet), terminating in a spherical cluster of small greenish white flowers. The concentric leaf bases of the developing plant swell to form the underground edible bulb. Most commercially cultivated onions are grown from the plant’s small black seeds, which are sown directly in the field, but onions may also be grown from small bulbs or from transplants. Onions are very hardy and can survive in a wide range of growing conditions. The bulbs vary in size, shape, colour, and pungency, though warmer climates generally produce onions with a milder, sweeter flavour than do other climates. The onion’s characteristic pungency results from the sulfur-rich volatile oil it contains; the release of this oil during peeling or chopping brings tears to the eyes. Onions are among the world’s oldest cultivated plants. They were probably known in India, China, and the Middle East before recorded history. Ancient Egyptians regarded the spherical bulb as a symbol of the universe, and its name is probably derived from the Latin unus, meaning “one.” The Romans introduced the onion to Britain and, in the New World, Native Americans added a highly pungent wild onion to their stews. Curative powers have been attributed to onions throughout the centuries; they have been used in folk medicine for such varied ailments as colds, earaches, laryngitis, animal bites, burns, and warts. Most whole onions are slightly dried before marketing, making their skins dry and paper-thin. Onions are also available in various processed forms. Boiled and pickled onions are packed in cans or jars. Frozen onions are available chopped or whole, and bottled onion juice is sold for use as a flavouring. Dehydrated onion products have been available since the 1930s; such products include granulated, ground, minced, chopped, and sliced forms. Onion powder is made by grinding dehydrated onions and is sometimes packaged in combination with salt. Dried onion products are used in a variety of prepared foods and are also sold directly to the consumer for use as condiments. • Globe-shaped onions may be white, yellow, or red. They have strong flavour and are used chiefly for soups, stews, and other prepared dishes and for frying. • Bermuda onions are large and flat, with white or yellow colour and fairly mild taste. They are often cooked and may be stuffed, roasted, or French-fried. They are also sliced and used raw in salads and sandwiches. • Spanish onions are large, sweet, and juicy, with colour ranging from yellow to red. Their flavour is mild, and they are used raw and sliced for salads and sandwiches and as a garnish. 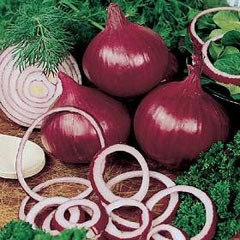 • Italian onions, or cipollini onions, are flat, with red colour and mild flavour. They are used raw for salads and sandwiches, and their red outer rings make an attractive garnish. • Shallots are a small, angular variety of onion. They are typically white with a brown or red skin and have a mild flavour. The green leaves can also be eaten. • Pearl onions are not a specific variety but are small, round, white onions harvested when 25 mm (1 inch) or less in diameter. They are usually pickled and used as a garnish. Small white onions that are picked when between 25 and 38 mm (1 and 1.5 inches) in diameter are used to flavour foods having fairly delicate taste, such as omelets and other egg dishes, sauces, and peas. They are also served boiled or baked. • Green onions, also called scallions and spring onions, are young onions harvested when their tops are green and the underdeveloped bulbs are 13 mm (0.5 inch) or less in diameter. Their flavour is mild, and the entire onion, including top, stem, and bulb, is used raw in salads and sauces, as a garnish, and also as a seasoning for prepared dishes. So, is this why Bulbasaur is #1 Pokemon? Frankly, I have no idea whatsoever! Grape, (genus Vitis), any member of the grape genus, Vitis (family Vitaceae), with about 60 species native to the north temperate zone, including varieties that may be eaten as table fruit, dried to produce raisins, or crushed to make grape juice or wine. Vitis vinifera, the species most commonly used in wine making, was successfully cultivated in the Old World for thousands of years and was eventually brought to California. Fossilized grape leaves, stem pieces and seeds unearthed from Neogene and Paleogene deposits (those about 2.6 to 65 million years old) in the Northern Hemisphere indicate the long existence and wide distribution of “the vine,” as it was known to the ancients. Several species are native to North America, notably V. labrusca or V. aestivalis, the American wild bunch grape, and V. rotundifolia, the popular muscadine grape of the southeastern U.S. The grape is usually a woody vine, climbing by means of tendrils (modified branches) and when untrained often reaching a length of 17 metres (56 feet) or more. In arid regions it may form an almost erect shrub. The leaves are alternate, palmately lobed, and always tooth-edged. Small greenish flowers, in clusters, precede the fruit, which varies in colour from almost black to green, red, and amber. Botanically, the fruit is a berry, more or less globular, within the juicy pulp of which lie the seeds. In many varieties the fruit develops a whitish powdery coating, or bloom. Grapes contain such minerals as calcium and phosphorus and are a source of vitamin A. All grapes contain sugar (glucose and fructose) in varying quantities depending upon the variety. Those having the most glucose are the most readily fermented. Grape cultivation, or viticulture, is nearly as old as civilization. Details for grape and wine production figured in the hieroglyphics of the 4th (2400 BCE), 17th, and 18th dynasties of Egypt. According to the Bible, Noah planted a vineyard. In Homer’s time, wine was a regular commodity among the Greeks. The Phoenicians carried the grape into France about 600 BCE. The Romans planted grapes in the Rhine valley not later than the 2nd century CE. Pliny the Elder described 91 varieties of grapes, distinguished 50 kinds of wines, and described vine-training methods. Coinciding with the westward spread of grape culture, grapes were moved into the Orient by way of India. As new lands were colonized, the grape was taken along, so that it is cultivated on all continents and islands where the climate is favourable. Vinifera grapes require long, dry, warm-to-hot summers and cool winters for their best development. Severe winter conditions destroy unprotected vines; spring frosts occurring after the vines start growth will kill the shoots and clusters. Grapes are adapted to a wide range of soils, ranging from blow sands to clay loams, from shallow to very deep soils, from highly calcareous to noncalcareous soils, and from very low to high fertility. Commercial grape varieties are propagated with cuttings, segments or canes, or grafts. Cuttings are usually grown for one year in a nursery to develop roots. The grafts consist of a segment of a stem of a fruiting variety placed on a rootstock cutting. The rootstock cuttings are field budded to the desired fruiting variety in late summer after being planted in the vineyard. The point of union of grafted or budded vines must be situated well above the ground level in order to prevent the production of scion roots. Training is necessary to develop a vine of desirable form. It is accomplished by pruning the young vine and then tying both it and its growth to a support. Pruning is the most important single vineyard operation. With wine and raisin varieties, it is usually the sole means of regulating the crop, largely determining not only the quality of the fruit but also the quality of the wood for the next year. At the annual pruning, 90 to 95 percent or more of the year’s growth is removed, leaving the spurs or fruit canes or both. The grape is subject to several parasites, including Phylloxera, a vine louse native to eastern America, brought into Europe on American vines in the late 1800s, causing widespread vineyard damage, finally halted by grafting the European varieties to American rootstock more resistant to this parasite. Grapes are harvested upon reaching the stage best suited for the intended use. Wine grapes are harvested when sugar content reaches its highest point, and the skins are covered with a waxy coating, trapping the yeasts that will later help produce fermentation. Delays in harvesting may cause unpleasant aroma in the wine produced or allow bacteria to attack the grape sugar. The mature fruit of all varieties, about 8,000 altogether, will ferment into a kind of wine when crushed, and most grapes can be dried or eaten fresh. But only a limited number of varieties produce standard or higher quality wines, three varieties account for most of the raisins of commerce, only 15 to 20 varieties are grown extensively as table grapes, a single variety yields the bulk of sweet juice produced in the United States, and only a few varieties are used for canning. Acreage devoted to cultivation of grapes averaged more than 3,500,000 acres (1,400,000 hectares) in the 1970s in France, Italy, and Spain; more than 1,000,000 acres in Turkey; and more than 650,000 acres in Algeria, Argentina, Greece, Hungary, Portugal, Romania, and the United States. Other principal grape-producing countries with more than 280,000 acres of vines include Australia, Bulgaria, Chile, Germany, Syria, and South Africa. Akashi Strait Bridge, also called Akashi Kaikyo Bridge or Pearl Bridge, suspension bridge across the Akashi Strait (Akashi-kaikyo) in west-central Japan. It was the world’s longest suspension bridge when it opened on April 5, 1998. The six-lane road bridge connects the city of Kōbe, on the main island of Honshu, to Iwaya, on Awaji Island, which in turn is linked (via the Ōnaruto Bridge over the Naruto Strait) to the island of Shikoku to the southwest. These two bridges—together with the Seto Great Bridge between Kojima (Honshu) and Sakaide (Shikoku)—are the main components of the Honshu-Shikoku Bridge Project across Japan’s Inland Sea. The Akashi Strait Bridge is 12,831 feet long (3,911 metres) and has three spans. The central span is 6,532 feet (1,991 metres) long, and each of the two side spans measures 3,150 feet (960 metres). The two main supporting towers stand 975 feet (297 metres) above the strait’s surface, making it one of the tallest bridges in the world. The central span was originally designed to be 6,529 feet (1,990 metres) long, but the Kōbe earthquake of 1995 forced the two towers, which were still under construction, more than 3 feet (1 metre) farther apart. The Akashi Strait Bridge stands in a seismically unstable region that also experiences some of the Earth’s most severe storms. Thus, engineers thus used a complex system of counterweights, pendulums, and steel-truss girders to allow the bridge to withstand winds of up to 180 miles (290 km) per hour. Despite these buffers, the bridge can expand and contract several feet in a single day. The challenges posed by the bridge inspired innovations in wind-tunnel and cable-fabrication technology. The Akashi Kaikyō Bridg is a suspension bridge, which links the city of Kobe on the Japanese mainland of Honshu to Iwaya on Awaji Island. It crosses the busy Akashi Strait (Akashi Kaikyō in Japanese) as part of the Honshu–Shikoku Highway. It was completed in 1998, and has the longest central span of any suspension bridge in the world, at 1,991 metres (6,532 ft; 1.237 mi). It is one of the key links of the Honshū–Shikoku Bridge Project, which created three routes across the Inland Sea. The bridge has three spans. 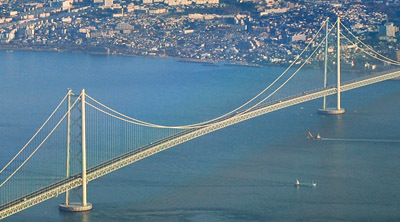 The central span is 1,991 m (6,532 ft; 1.237 mi), and the two other sections are each 960 m (3,150 ft; 0.60 mi). The bridge is 3,911 m (12,831 ft; 2.430 mi) long overall. The two towers were originally 1,990 m (6,530 ft; 1.24 mi) apart, but the Great Hanshin earthquakeon January 17, 1995, moved the towers so much (only the towers had been erected at the time) that the span had to be increased by 1 m (3.3 ft). The Akashi–Kaikyo bridge has a total of 1,737 illumination lights: 1,084 for the main cables, 116 for the main towers, 405 for the girders and 132 for the anchorages. Sets of three high-intensity discharge lamps in the colors red, green and blue are mounted on the main cables. The RGB colour model and computer technology make for a variety of combinations. Twenty-eight patterns are used for occasions as national or regional holidays, memorial days or festivities. Yellowstone National Park, the oldest, one of the largest, and probably the best-known national park in the United States. It is situated principally in northwestern Wyoming and partly in southern Montanaand eastern Idaho and includes the greatest concentration of hydrothermal features in the world. The park was established by the U.S. Congress on March 1, 1872, as the country’s first national park. It is also generally considered to have been the first national park in the world, though some naturalists and others have argued that there is evidence that indicates that the creation of Yellowstone was predated by the creation of Bogd Khan Mountain National Park in Mongolia, which may date from as early as 1778. Yellowstone was designated a UNESCObiosphere reserve in 1976 and a World Heritage site in 1978. The park, which forms a squarelike rectangle with an irregular eastern side, is 63 miles (101 km) from north to south and 54 miles (87 km) from east to west at its widest point and covers an area of 3,472 square miles (8,992 square km). The John D. Rockefeller, Jr., Memorial Parkway, an 80-mile (130-km) scenic roadway that was established in 1972, connects Yellowstone with Grand Teton National Park to the south. In addition, Yellowstone is surrounded by Gallatin (northwest and north), Custer (northeast), Shoshone (northeast and east), Bridger-Teton (southeast and south), and Caribou-Targhee (southwest) national forests. Headquarters are at Mammoth Hot Springs near the northern entrance to the park. Yellowstone is situated in a region that has been volcanically and seismically active for tens of millions of years. Tectonic movement of the North American Plate has thinned Earth’s crust in the area, forming a hot spot (a place where a dome of magma, or molten rock, comes close to the surface). About 2.1 million years ago a subsurface magma dome that had been building up in the Yellowstone area blew up in one of the world’s most cataclysmic volcanic eruptions. Some 600 cubic miles (2,500 cubic km) of rock and ash were ejected, equivalent to about 6,000 times the amount of volcanic material that was released during the eruption of Mount Saint Helens in 1980. (Observations made in the early 21st century indicated that this single eruption actually consisted of two events about 6,000 years apart: one very large and a second much smaller one. Subsequent massive eruptions occurred about 1,300,000 and 640,000 years ago—the last event (consisting in large part of lavaflows) producing about two-fifths as much material as the first one. Yellowstone’s relief is the result of tectonic activity (volcanism and earthquakes) combined with the erosional actions of ice and water. Most of the park consists of broad volcanic plateaus with an average elevation of about 7,875 feet (2,400 metres). Three mountain ranges, each aligned roughly north to south, protrude into the park: the Gallatin Range in the northwest, the Absaroka Range in the east, and the northern extremity of the Teton Range along the park’s southwestern boundary. The tallest mountains in the park are in the Absarokas, where many summits exceed elevations of 10,000 feet (3,050 metres). The range’s Eagle Peak, on the park’s boundary in the southeast, is the high point, reaching 11,358 feet (3,462 metres). Aside from its rugged mountains and spectacular deep glacier-carved valleys, the park has unusual geologic features, including fossil forests, eroded basaltic lava flows, a black obsidian (volcanic glass) mountain, and odd erosional forms. Yellowstone is also known for its many scenic lakes and rivers. The park’s largest body of water is Yellowstone Lake, which, having a surface area of 132 square miles (342 square km) and lying at an elevation of 7,730 feet (2,356 metres), is the highest mountain lake of its size in North America. The West Thumb area—a knoblike protrusion of the lake on its west side—was formed by a relatively small eruption in the caldera about 150,000 years ago. The next largest lake, Shoshone Lake, lies in the caldera southwest of Yellowstone Lake. The park’s most extensive drainage system is that of the Yellowstone River, which enters at the southeast corner, flows generally northward (including through Yellowstone Lake), and exits near the northwest corner of the park. The river’s Yellowstone Falls, located in the north-central part of the park, descend in two majestic cascades: the Upper Falls, with a drop of 114 feet (35 metres), and the Lower Falls, with a drop of 308 feet (94 metres). The falls constitute the western end of the spectacular Grand Canyon of the Yellowstone. There the river has cut a gorge 19 miles (30 km) long, between 800 and 1,200 feet (240 and 370 metres) deep, and up to 4,000 feet (1,200 metres) wide. The walls of the canyon, sculpted from decomposed rhyolite (volcanic rock), are brilliantly coloured in hues of red, pink, yellow, buff, lavender, and white. Other streams of note include the Snake River, which rises and flows along the park’s southern boundary before joining the Lewis River and heading south; and the Gallatin and Madison rivers, both of which rise in and flow through the northwestern part of Yellowstone before exiting the park and eventually forming (along with the Jefferson River) the Missouri River in southern Montana. Yellowstone’s principal attractions, however, are its some 10,000 hydrothermal features, which constitute roughly half of all those known in the world. The region’s deeply fractured crust allows groundwater to seep down to where it makes contact with the magma. The superheated and mineral-rich water then returns to the surface as steam vents, fumaroles, colourful hot pools, mud cauldrons, paint pots, hot springs and terraces, hot rivers, and geysers. It is thought that the constant stream of minor tremors that shake the region act to keep open the myriad cracks and fissures in the ground that might otherwise become clogged with minerals precipitating out of the hot water as it cools. Of the park’s more than 300 geysers—greater than half of the world’s total—many erupt to heights of 100 feet (30 metres) or more. Old Faithful, in west-central Yellowstone, the most famous geyser in the park, erupts fairly regularly, roughly every 90 minutes with a range of reasonably predictable variability. Many of Yellowstone’s noted geysers and other thermal features are located in the western portion of the park, between Old Faithful and Mammoth Hot Springs some 50 miles (80 km) to the north. The greatest concentrations are in the Upper Geyser, Midway Geyser, and Lower Geyser basins that extend northward for about 10 miles (16 km) from Old Faithful. These include Giantess Geyser near Old Faithful, with a two- to six-month wait between eruptions, and the deep-blue Morning Glory Pool just to the northwest in the Upper Geyser Basin; Excelsior Geyser in the Midway Geyser Basin, which rarely erupts but discharges thousands of gallons of boiling water per minute; and the Fountain Paint Pots in the Lower Geyser Basin, with pink, plopping mud geysers, fumaroles, and a blue hot-spring pool. Norris Geyser Basin lies roughly midway between the southern hydrothermal area and Mammoth Hot Springs. It is noted for having some of the hottest and most acidic hydrothermal features in the park and also includes Steamboat Geyser, which can throw water to heights of 300 feet (90 metres) and higher and is the world’s highest-erupting geyser. Mammoth Hot Springs consists of a broad terraced hillside of travertine (calcium carbonate) deposited there by dozens of hot springs. Among its notable formations are the multicoloured Minerva Terrace and Angel Terrace, each which consists of dazzling white rock that in many areas is tinted by microorganisms on the rock. Yellowstone’s climate can be described as cool temperate and continental. It is also considerably variable, influenced by the park’s high average elevation, relatively high latitude, location deep within the continent, and mountainous terrain. In general, the north-central portion of Yellowstone tends to have wetter summers and drier winters than the rest of the park, where the moisture regimens are reversed. Temperatures almost always decrease with elevation gain. Because of Yellowstone’s large area and variegated topography, weather conditions at different locations within the park can vary widely at any given time. In addition, conditions can change dramatically in a short period of time at one location. Summer days are warm and relatively sunny, with daytime temperaturesreaching about 80 °F (27 °C) in July at lower elevations before dropping to nighttime lows in the 40s or 50s F (about 10 °C); temperatures are usually cooler higher in the mountains. Although precipitation totals in the warm months generally are light, summer afternoon thunderstorms are common. Winters are cold and snowy, as temperatures rarely rise above the mid-20s F (about −4 °C) and often drop to 0 °F (−18 °C) or lower at night. Annual precipitation amounts vary with location and elevation, being lowest in the north (about 10 inches [250 mm]) and highest on the western slopes of the northern Teton foothills (about 80 inches [2,000 mm]). Snowfall is heavy in most areas, especially at higher elevations, and typically begins in early autumn and continues into April or May. Some 1,350 species of flowering plants (roughly 1,150 of them native) have been identified in Yellowstone. About four-fifths of the park’s area is forested, and the vast majority of the tree growth consists of lodgepole pines. Among the several other conifer species in the park are whitebark pine, found at higher elevations, especially in the Absarokas; and Douglas firs, which dominate at lower elevations, notably in northern areas. Cottonwoods and willows grow along streams, and stands of aspens occur in many sections. Hundreds of types of wildflowers thrive in a variety of habitats. The earliest blossom in April and the latest in September. Common species include phlox, lupines, cinquefoils, larkspurs, and Indian paintbrushes. Animal life in Yellowstone is typical of the Rocky Mountain West, and the park boasts the greatest assemblage of mammals—more than five dozen species—in the United States, outside of Alaska. Bison (buffalo), the largest of the mammals, were brought back from near extinction at the beginning of the 20th century. They now constitute several thousand head divided into two subpopulations that, respectively, inhabit summer breeding grounds in the Hayden Valley (north-central) and Lamar Valley (northeast) areas of the park. Other large mammals often seen in Yellowstone include elk (wapiti), mule deer, black bears, foxes, and coyotes. There are smaller populations of brown (grizzly) bears, bighornsheep, pronghorns, mountain goats, and moose. Bobcats are thought to be present throughout the park, but their numbers are unknown, and there are occasional sightings of lynx and pumas (mountain lions). Common smaller mammals include badgers, martens, weasels, river otters, hares and rabbits, shrews, a variety of bats, and many species of small rodents. Wolves were successfully reintroduced into Yellowstone in 1995 and are now found throughout much of the park. Beavers have also made a significant comeback, and several hundred live along streams and lakes, mainly in the northwest, southeast, and southwest. More than 300 different species of birds have been identified as living year-round or seasonally in Yellowstone or migrating through the park in spring and autumn. Roughly half of that total nest there during the summer. Songbirds and woodpeckers constitute the greatest number of species. Among the permanent residents are jays, chickadees, nuthatches, ravens, and waterfowl such as trumpeter swans and Canadageese. Summer breeders of interest include sandhill cranes, white pelicans, and common loons—with Yellowstone representing one of the southernmost points that the latter group reaches in North America. The populations of three of the park’s raptors—bald eagles, ospreys, and peregrine falcons—have made significant recoveries after having been severely depleted in the mid-20th century. Each species has been the subject of a long-term study and monitoring program in Yellowstone. Most of the park’s lakes and streams have natural fish populations, but many are located above waterfalls and other impediments and have introduced populations. For decades Yellowstone’s waterways were stocked with fish—including three indigenous sport species (cutthroat trout, Arctic grayling, and Rocky Mountain whitefish) and several nonnative species (mainly trout)—but that practice was ended in the 1950s. Some of the more remote lakes and streams subsequently reverted to their fishless state. Concerns over depleting stocks of native sport fish prompted park officials to implement stringent fishingregulations that included a catch-and-release policy for those species. Fewer than a dozen reptile and amphibian species are found in Yellowstone, in large part because of the region’s cold and relatively dry climate. Notable types include prairie rattlesnakes (Crotalus viridis), the only venomous species in the park; boreal chorus frogs (Pseudacris triseriata maculata), known for the loud call of the males during breeding season; and blotched tiger salamanders (Ambystoma tigrinum melanostictum), which are common in fishless lakes and ponds. Also of note are the many varieties of thermophiles (heat-tolerant extremophiles) that thrive in the park’s hydrothermal features and are responsible for many of their distinctive colours. Prokaryotic types—e.g., varieties of algae and bacteria—can be found in such features as Norris Geyser Basin and Mammoth Hot Springs, respectively. Thermophilic archaea—which can survive in the most extreme conditions—are found in features throughout the park, including Mud Volcano along the Yellowstone River north of Yellowstone Lake, Grand Prismatic Spring in Midway Geyser Basin, and Roaring Mountain north of the Norris area. Archaeological evidence recovered in Yellowstone indicates that there has been a sustained human presence in the region since sometime after the end of the last glaciation there (about 13,000 to 14,000 years ago), with the oldest artifacts dating to more than 11,000 years ago. Little is known about those early peoples. Wind River Shoshone (also called Sheep Eaters) are thought to have arrived in the Yellowstone area about 1400 CE. Many other groups followed, and those peoples either lived in or near the land now occupied by the park or visited the area to hunt, trade, or conduct ceremonies. The first person of European ancestry to venture into the Yellowstone region was American trapper and explorer John Colter, who reached the area in 1807–08 after having been a part of and then leaving the Lewis and Clark Expedition in 1806. Other trappers—including Jim Bridger, Joseph Meeks, and Osborne Russell—told of seeing the canyon, lake, and geysers. The first published account of the region was by Daniel Potts, whose letter to his brother vividly describing Yellowstone Lake and the West Thumb Geyser Basin appeared in a Philadelphia newspaper in 1827. Another trapper, Warren Angus Ferris, visited Yellowstone and was the first to use the name geyser for the hydrothermal features there. Ferris, who was a trained surveyor, prepared a map of the Yellowstone area in 1836. An official government party led by Capt. William F. Raynolds failed to reach Yellowstone in 1860, but the well-planned Washburn-Langford-Doane and Hayden expeditions of 1870 and 1871, respectively, undertook thorough surveys of the region. Proposals for the federal government to protect the Yellowstone region had first been voiced in the mid-1860s, about the same time that such ideas were also being debated for the Yosemite area in California. Part of the impetus was through Jay Cooke and his Northern Pacific Railway Company, which was building a rail line from Lake Superior to the Pacific Northwest that passed just north of Yellowstone. Ferdinand V. Hayden, upon returning from leading the 1871 survey, had informed Cooke that Yellowstone was commercially suited only for recreation. Cooke (seeing the potential for tourism), along with returning members of the 1870 and 1871 journeys and others, became strong advocates for the creation of a national park at Yellowstone. Their cause was helped significantly by the stunning images of the area created by two members of the 1871 expedition: paintings by Thomas Moran (whose presence on the trip had been partially funded by Cooke) and photographs by William Henry Jackson (the official photographer). The U.S. Congress acted quickly to write a bill authorizing the creation of Yellowstone National Park, which was passed and signed into law by Pres. Ulysses S. Grant on March 1, 1872—unlike Yosemite, where, initially, a state park was established and only later was put under federal control. The park’s first superintendent (1872–77), Nathaniel P. Langford (who had been a member of the 1870 expedition), was largely ineffectual, primarily because Congress allotted no administrative funds, and he had to find other work and thus was rarely there. His successor, Philetus W. Norris (1877–82), however, undertook considerable scientific study of the park, attempted to implement some basic conservation measures, and supervised the construction of the park’s first headquarters at Mammoth and many of its early roads. Travel to and in the park in those early years was arduous and undertaken by only a small number of hardy adventurers each year. Added to the physical travel challenges at that time was the ongoing fighting between Native Americans and the U.S. government. The Battle of the Little Bighorn (June 1876) had taken place only some 150 miles (240 km) to the northeast of Yellowstone. The following year Chief Joseph and his Nez Percé band traversed Yellowstone (west-east) in their attempt to evade capture by U.S. troops. They took and briefly held several park visitors hostage before all escaped or were released. By the early 1880s, however, the hostilities had largely ended, and the Northern Pacific had completed its main track to the Pacific. A spur line from it was built southward to near the park’s northern entrance (just north of park headquarters), and the company began heavily promoting tourism to Yellowstone. The first hotel in the park (at Mammoth) opened in 1883. The railway acquired that hotel in 1886 and began building other overnight accommodations in the park. That same year the U.S. Army took over administration of Yellowstone. The military was able to improve protection of park properties from vandalism and from wildlife poachers—notably, stopping the slaughter of bison in the park. It also undertook major infrastructure improvements, including the construction of Fort Yellowstone at Mammoth (the structures of which—built between 1890 and 1913—are still used as the park’s headquarters) and much of the park’s road system. The Union Pacific Railroad completed a line to the park’s west entrance in 1907, and the following year visitors began arriving at what became West Yellowstone, Idaho. Private automobiles were first allowed into the park in 1915. Travel to and within Yellowstone improved considerably in the early 20th century, and the number of visitors each year increased steadily. More lodging was built to accommodate them, most notably the magnificent Old Faithful Inn (completed 1904) in the Upper Geyser Basin. Among the important dignitaries to visit the park in its early decades were Presidents Chester A. Arthur (1883) and Theodore Roosevelt (1903). With the establishment of the National Park Service (NPS) in 1916, the army relinquished full administration of Yellowstone to the NPS and its newly created ranger force by 1918. The new stewards took steps to increase the amount of scientific exploration in the park and to establish education programs for the growing number of tourists. Park attendance grew annually until the U.S. entry into World War II in 1941 (with the exception of the first several years of the Great Depression of the 1930s), exceeding 100,000 for the first time in 1923 and a half million in 1940 before dropping off drastically during the travel-restricted war years. Yellowstone’s boundaries were adjusted twice in that period (1929 and 1932), after which the park reached its present size. As automobile travel throughout the country grew dramatically in the postwar period, so too did Yellowstone’s annual attendance, surpassing the million mark in 1948 and double that in 1965. This great influx of visitors strained the park’s aging infrastructure, and, as part of NPS’s Mission 66 system-wide renovation program (1955–66), many of Yellowstone’s facilities were refurbished—notably the Canyon Village complex at Yellowstone Falls. In addition, there has been an ongoing program to rebuild and widen most of the roadways in the park to accommodate the heavy car traffic (regular passenger train service ended in 1960). Resource-management policies adopted in the 1970s included strict bans on feeding wildlife (notably bears) and greater regulations on fishing, including prohibiting fishing from the famed Fishing Bridge at the north end of Yellowstone Lake. A significant event in Yellowstone’s more recent history was the great fire of 1988 that charred some two-fifths of the park’s forestlands and nearly reached Old Faithful Inn. The forests subsequently have recovered, although areas have been subject to damage by insect pests. Also noteworthy were the reintroduction of wolves in the park, beginning in 1995, and the growth of the wolf population to some 100 individuals in little more than a decade. Annual visits to Yellowstone first exceeded three million in 1992 and have hovered on either side of that mark since then. Road access to Yellowstone is via entrances in the north, northeast, east, south, and west; a highway also skirts the northwestern portion of the park. The park itself has about 465 miles (750 km) of roads, some two-thirds of which are paved. The road linking the north and northeast entrances stays open year-round, but other park roads close for the winter in early November and reopen between late April and late May. However, those roads reopen to authorized over-snow vehicles between December and March. Yellowstone has extensive facilities for park goers, including nine visitor’s centres (only one of which, at Mammoth, is open year-round) and nine hotels and lodges. In addition, there are dozens of dining facilities, service stations, and stores selling food and a variety of other items—most of them concentrated at Mammoth or at locations along the central loop road. All close for the winter, except for lodging and some other facilities that reopen in the Old Faithful and Mammoth areas for the winter season. A dozen developed campgrounds in Yellowstone are maintained by the NPS or by a private company, and there are more than 300 primitive backcountry campsites that are accessible via the park’s roughly 1,000 miles (1,600 km) of trails. In addition, some 15 miles (24 km) of boardwalks are maintained that give visitors access to many of the best-known hydrothermal features. Hiking, backpacking, camping, fishing, boating, and wildlife watching are popular outdoor activities, as are cross-country skiing and snowshoeing in winter. A noted hike ascends a former automobile road up Mount Washburn in the north-centre of the park and affords spectacular vistas from its 10,243-foot (3,122-metre) summit. Tomato, (Solanum lycopersicum), flowering plant of the nightshade family (Solanaceae), cultivated extensively for its edible fruits. Labelled as a vegetable for nutritional purposes, tomatoes are a good source of vitamin C and the phytochemical lycopene. The fruits are commonly eaten raw in salads, served as a cooked vegetable, used as an ingredient of various prepared dishes, and pickled. Additionally, a large percentage of the world’s tomato crop is used for processing; products include canned tomatoes, tomato juice, ketchup, puree, paste, and “sun-dried” tomatoes or dehydrated pulp. Tomato plants are generally much branched, spreading 60–180 cm (24–72 inches) and somewhat trailing when fruiting, but a few forms are compact and upright. Leaves are more or less hairy, strongly odorous, pinnately compound, and up to 45 cm (18 inches) long. The five-petaled flowers are yellow, 2 cm (0.8 inch) across, pendant, and clustered. Fruitsare berries that vary in diameter from 1.5 to 7.5 cm (0.6 to 3 inches) or more. They are usually red, scarlet, or yellow, though green and purple varieties do exist, and they vary in shape from almost spherical to oval and elongate to pear-shaped. Each fruit contains at least two cells of small seeds surrounded by jellylike pulp. The plant requires relatively warm weather and much sunlight; it is grown chiefly in hothouses in cooler climates. Tomatoes are usually staked, tied, or caged to keep the stems and fruits off the ground, and consistent watering is necessary to avoid blossom-end rot and cracking of the fruits. The plants are susceptible to a number of pests and diseases, including bacterial wilt, early blight, mosaic virus, Fusarium wilt, nematodes, and tomato hornworms. Many of these problems can be controlled with crop rotation, the use of fungicides and pesticides, and the planting of resistant varieties. The tiny currant tomato (S. pimpinellifolium) is a closely related species and has been used by breeders to hybridize several pest- and disease-resistant tomato varieties. The wild species originated in the Andes Mountains of South America, probably mainly in Peru and Ecuador, and is thought to have been domesticated in pre-Columbian Mexico; its name is derived from the Náhuatl (Aztec) word tomatl. The tomato was introduced to Europe by the Spanish in the early 16th century, and the Spanish and Italians seem to have been the first Europeans to adopt it as a food. In France and northern Europe the tomato was initially grown as an ornamental plant and was regarded with suspicion as a food because botanists recognized it as a relative of the poisonous belladonna and deadly nightshade. Indeed, the roots and leaves of the tomato plant are poisonous and contain the neurotoxin solanine. The Italians called the tomato pomodoro (“golden apple”), which has given rise to speculation that the first tomatoes known to Europeans were yellow. It has been suggested that the French called it pomme d’amour (“love apple”) because it was thought to have aphrodisiacal properties. Some scholars assert, however, that the tomato was at first taken to be a kind of eggplant, of which it is a close relative. The eggplant was called pomme des Mours (“apple of the Moors”) because it was a favourite vegetable of the Arabs, and pomodoro and pomme d’amour may be corruptions of that name. Tomatoes were introduced to North America from Europe. Thomas Jefferson is known to have raised them at Monticello in 1781. 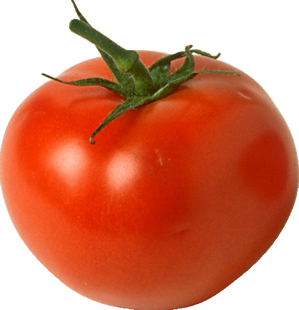 The tomato was used for food in Louisiana as early as 1812, but not in the northeastern states until about 1835. It did not attain widespread popularity in the United States until the early 20th century. The plant is now grown commercially throughout the world. Eucalyptus, large genus of mostly very large trees, of the myrtle family (Myrtaceae), native to Australia, Tasmania, and nearby islands. More than 500 species have been described. In Australia the eucalypti are commonly known as gum trees or stringy bark trees. Many species are cultivated widely throughout the temperate regions of the world as shade trees or in forestry plantations. Economically, eucalyptus trees constitute the most valuable group within the order Myrtales. The leaves are leathery and hang obliquely or vertically. The flower petals cohere to form a cap when the flower expands. The fruit is surrounded by a woody, cup-shaped receptacle and contains numerous minute seeds. Possibly the largest fruits - from 5 to 6 centimetres (2 to 2.5 inches) in diameter - are borne by E. macrocarpa, also known as the mottlecah, or silverleaf, eucalyptus. The eucalypti grow rapidly, and many species attain great height. E. regnans, the giant gum tree or mountain ash of Victoria and Tasmania, attains a height of about 90 metres (300 feet) and a circumference of 7.5 m.
The leaf glands of many species, especially E. salicifolia and E. globulus, contain a volatile, aromatic oil known as eucalyptus oil. Its chief use is medical, and it constitutes an active ingredient in expectorants and inhalants. E. globulus, E. siderophloia, and other species yield what is known as Botany Bay kino, an astringent dark-reddish resin, obtained in a semifluid state from incisions made in the tree trunk. Eucalyptus wood is extensively used in Australia as fuel, and the timber is commonly used in buildings and fencing. Among the many species of timber-yielding eucalypti are E. salicifolia, E. botryoides, E. diversicolor (commonly called karri), E. globulus, E. leucoxylon (commonly called ironbark), E. marginata (commonly called jarrah), E. obliqua, E. resinifera, E. siderophloia, and others. The bark of many species is used in papermaking and tanning. • Jaundice is a yellowish discoloration of the skin, mucous membranes and of the white of the eyes caused by elevated levels of the chemical bilirubin in the blood (hyperbilirubinemia). The term jaundice is derived from the French word jaune, which means yellow. Jaundice is not a disease per se, but rather a visible sign of an underlying disease process. • Jaundice is typically seen when the level of bilirubin in the blood exceeds 2.5-3 mg/dL (milligrams per deciliter). • Jaundice in adults can be caused by a variety of medical conditions, some of which are serious and potentially life-threatening. 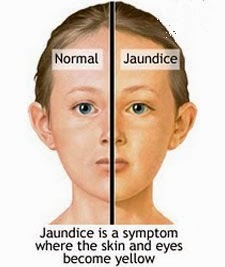 • Any adult who develops jaundice needs to undergo a comprehensive medical evaluation in order to determine its cause. • Neonatal jaundice, a condition seen in newborns, is most often a benign condition that improves without serious after effects). What are the signs and symptoms of jaundice in adults? How common is jaundice in adults? Who gets it? • Certain people with hereditary conditions (for example, thalassemia or hereditary spherocytosis) are at an increased risk of developing jaundice from hemolysis. • People who consume alcohol heavily are at an increased risk of developing alcoholic hepatitis, pancreatitis, and cirrhosis leading to jaundice. • People who are at an increased risk of exposure to the different types of viral hepatitis(for example, hepatitis B and hepatitis C) are at risk of developing jaundice at the time of infection or subsequently, if liver disease occurs or if liver cancer develops later. • Parasites (for example, liver flukes). • In certain individuals with jaundice, the treatment will consist of supportive care and can be managed at home. For example, most cases of mild viral hepatitis can be managed at home with watchful waiting and close monitoring by your doctor (expectant management). Novel medications for hepatitis C now can offer a cure for this condition. • Alcohol cessation is necessary in patients with cirrhosis, alcoholic hepatitis, or acute pancreatitis secondary to alcohol use. • Jaundice caused by drugs/medications/toxins requires discontinuation of the offending agent. In cases of intentional or unintentional acetaminophen (Tylenol) overdose, the antidote N-acetylcysteine (Mucomyst) may be required. • Various medications may be used to treat the conditions leading to jaundice, such as steroids in the treatment of some autoimmune disorders. Certain patients with cirrhosis, for example, may require treatment with diuretics and lactulose. • Antibiotics may be required for infectious causes of jaundice, or for the complications associated with certain conditions leading to jaundice (for example, cholangitis). • Blood transfusions may be required in individuals with anemia from hemolysis or as a result of bleeding. • Individuals with cancer leading to jaundice will require consultation with an oncologist, and the treatment will vary depending on the type and extent (staging) of the cancer. • Surgery and various invasive procedures may be required for certain patients with jaundice. For example, certain patients with gallstones may require surgery. Other individuals with liver failure/cirrhosis may require a liver transplant. • Take medications as instructed in order to prevent potential liver damage or unintentional overdose. Individuals with certain medical conditions (for example, G6PD deficiency or cirrhosis) should avoid certain medications altogether. Discuss medications with your health care professional. • Avoid high-risk behaviors such as unprotected physical relationship or intravenous drug use, and implement universal precautions when working with blood products and needles. This can decrease your risk of developing hepatitis B or hepatitis C.
• Consider being vaccinated against hepatitis A and hepatitis B. There is currently no available vaccine against hepatitis C.
• Avoid potentially contaminated food products or unsanitary water, as this may decrease your risk of developing hepatitis A. • When travelling to areas where malaria is endemic, take the recommended precautions and prophylactic medications in order to prevent the development of malaria. • Consume alcohol responsibly and only in moderation. This can prevent alcoholic hepatitis, alcoholic cirrhosis and pancreatitis, among other conditions. Certain individuals will need to avoid alcohol altogether. • Avoid smoking, as it is a risk factor for the development of pancreatic cancer, as well as many other malignancies. Cashew, (Anacardium occidentale), evergreen shrub or tree of the sumac family (Anacardiaceae), cultivated for its characteristically curved edible seeds, which are commonly called cashew “nuts” though they are not true nuts. 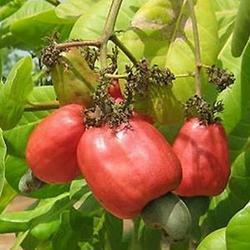 The domesticated cashew tree is native to the New World but commercially cultivated mainly in Brazil and India. The seeds, rich in oil and distinctively flavoured, are commonly used in South and Southeast Asian cuisine and are a characteristic ingredient of numerous chicken and vegetarian dishes of southern India. In Western countries they are eaten mainly as a premium-quality protein-rich snack food. The cashew is native to northeastern Brazil. Portuguese missionaries took it to East Africa and India during the late 16th century, where it became abundant at low altitudes near the seacoast. The tree produces wood that is useful in local economies for such practical items as shipping crates, boats, and charcoal as well as for a gum that is similar to gum arabic. The resin within the shells of the fruit is used as an insecticide and in the production of plastics; it also is important in traditional medicines. The cashew apple is used locally in beverages, jams, and jellies, though most cultivation is directed toward production of the valuable seed crop. Parts of the cashew must be handled with care by susceptible individuals because it is related to poison ivy and poison sumac and can cause an allergic reaction in some people. The plant may grow to 12 metres (40 feet) in height where the soil is fertile and the humidity high. The leathery leaves are spirally arranged and elliptical in shape. The curved fruit, which is not a true nut, is shaped like a large thick bean and can reach more than 2.5 cm (1 inch) long. It appears as though one of its ends has been forcibly sunk into a pear-shaped swollen stem (hypocarp), called the cashew apple. The cashew apple, which is an accessory fruit (e.g., not a true fruit), is about three times as large as the true fruit and is reddish or yellow. The true fruit has two walls, or shells. The outer shell is smooth, thin, and somewhat elastic and is olive green until maturity, when it becomes pale brown. The inner shell is harder and must be cracked like the shells of nuts to obtain the edible seed inside. A brown oily resin is produced between the two shells and can blister human skin. The cashew apples are picked by hand, and the curved fruits are first detached and then sun-dried. In some localities the dried fruits are roasted amid burning logs, where the heat causes the outer shells to burst open and release the caustic resin. The resin quickly catches fire, giving off fumes that can be injurious to the eyes and skin. In improved methods of roasting, the poisonous properties are dispelled in roasting cylinders. Later the inner shells are broken open by hand and the kernels heated to remove the seed coat. The wild cashew, or espavé (Anacardium excelsum), is a closely related tree that grows in Central and South America. The cashew apple, which is an accessory fruit (e.g., not a true fruit), is about three times as large as the true fruit and is reddish or yellow. Cashew nut is the most expensive nut here, but also the most delicious. Have you eaten the cashew apple? It is especially sour. Yes, I have. They are expensive in my place too. It is sour. Cashew apples and Cashew nuts are tasty. When I was young, I had seen how cashew nuts are burnt. Most people here don't like cashew apple, though, so it's rare to see someone eat one. Additional information : The cashew tree (Anacardium occidentale) is a tropical evergreen tree that produces the cashew seed and the cashew apple. It can grow as high as 14 m (46 ft), but the dwarf cashew, growing up to 6 m (20 ft), has proved more profitable, with earlier maturity and higher yields. 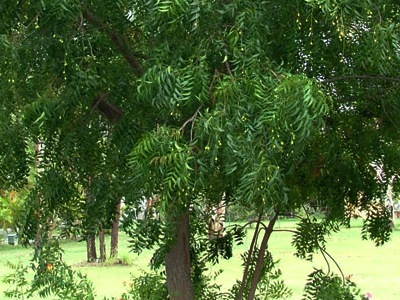 Neem, (Azadirachta indica), also called nim or margosa, fast-growing tree of the mahogany family (Meliaceae), valued as a medicinal plant, as a source of organic pesticides, and for its timber. Neem is likely native to the Indian subcontinent and to dry areas throughout South Asia. It has been introduced to parts of Africa, the Caribbean, and numerous counties in South and Central America. The plant has long been used in Ayurvedic and folk medicine and is used in cosmetics and in organic farming applications. Neem trees can reach 15–30 metres (49–98 feet) in height and have attractive rounded crowns and thick furrowed bark. The compound leaves have toothed leaflets and are typically evergreen but do drop during periods of extreme drought. The small fragrant white flowers are male/female or staminate (male) and are borne in clusters in the axils of the leaves. The fruit is a smooth yellow-green drupe and has a sweet-flavoured pulp. Neem is usually grown from seed but can be propagated from cuttings or root suckers. The plant is hardy and resilient and grows well in poor, rocky soils. Neem tolerates a wide variety of environmental conditions but cannot survive freezing temperatures or being waterlogged. Nearly all parts of the neem tree are useful, and many of its medicinal and cosmetic uses are based on its antibacterial and antifungal properties. Neem is commonly used in shampoos for treating dandruffand in soaps or creams for skin conditions such as acne, psoriasis, and athlete’s foot. It is also a component in some toothpastes and mouthwashes, especially in the Indian subcontinent, and young twigs are used directly as crude toothbrushes in rural areas. Neem leaves have long been used as a traditional treatment for diabetes, and there is some clinical evidence suggesting that it may help control blood sugar levels. Neem oil and neem bark and leaves are unsafe for consumption by pregnant women and can cause miscarriage. Oil extracted from the seeds can be used directly as an insect and mite repellent, insecticide, and fungicide and is the source of many commercial pesticide products, including dusts, granules, and concentrates. The primary active insecticidal ingredient, azadirachtin, works to disrupt the hormones involved with insect molting, preventing larvae from developing properly into adults, and is a feeding inhibitor. Neem oil can kill soft-bodied insects on contact and decreases mating and reproductive behaviours, reducing pest fecundity. As a fungicide, neem oil is used to control rust, black spot, mildew, scab, anthracnose, and blight. Given that neem oil breaks down quickly with exposure to ultraviolet light, repeated applications are often necessary. Neem-based pesticides generally have low toxicity for mammals and are common in organic farming applications. Cauliflower, (Brassica oleracea, variety botrytis), highly modified form of cabbage in the mustard family (Brassicaceae), grown for its edible masses of partially developed flower structures and fleshy stalks. Cauliflower is high in vitamins C and K and is frequently served as a cooked vegetable or used raw in salads and relishes. Cauliflowers are annual plants that reach about 0.5 metre (1.5 feet) tall and bear large rounded leaves that resemble collards (Brassica oleracea, variety acephala). As desired for food, the terminal cluster forms a firm, succulent “curd,” or head, that is an immature inflorescence (cluster of flowers). The broad leaves extend far above the curd and are often tied together before harvest to shade the curd and prevent discoloration. Commercially, white cauliflower is the most common, though orange, purple, green, and brown cultivars also exist. The plants produce cross-shaped yellow flowers and bear seeds in dry capsules known as siliques. Cauliflower is a cool-weather crop and requires consistent temperatures of about 16 °C (60 °F) to produce heads. The plants grow best in moist nitrogen-rich soil and will produce only small heads if stressed with drought. Clubroot, a fungal disease, is a common problem for cauliflower crops, and the plants are fairly susceptible to a number of foliage-eating insects, including cabbage loopers, cabbage whites, and aphids. The edible flower of Brassica olearacea botrytis, normally creamy‐white in colour, although some cultivars have green or purple flowers. Horticulturally, varieties that mature in summer and autumn are called cauliflower, and those that mature in winter broccoli, but commonly both are called cauliflower. A 90‐g portion is a rich source of vitamin C; a good source of folate; a source of vitamin B6; provides 1.8 g of dietary fibre and supplies 8 kcal (33 kJ).